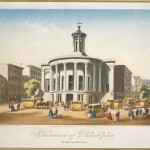 Derived from a print created by J.C. Wild in 1832, this view published in 1856 looks west from the intersection of Third, Walnut, and Dock Streets and depicts the Merchants' Exchange constructed 1832-33 after the designs of Philadelphia architect William Strickland for the Philadelphia Exchange Company. (The building now serves as headquarters for Independence National Historical Park.) The scene includes street and pedestrian traffic concentrated near the business center and the City Railroad tracks. Many horse-drawn omnibuses, including the Spruce Street, Navy Yard, West Philadelphia and Fifth Street lines, arrive and depart. Omnibus routes set the precedent for later street-based public transportation systems in Philadelphia. This map is based on the information contained in George West Blake, “Record of Omnibus Lines in the City of Philadelphia, 1851-1854,” held by the Hagley Museum and Library, 298 Buck Road, Wilmington, Del. This notebook is the best surviving source for Philadelphia’s omnibus network at its peak. One of the earliest forms of public transportation in Philadelphia (and its early suburbs prior to the 1854 consolidation of the city with the county) was the horse-drawn omnibus introduced in 1831. 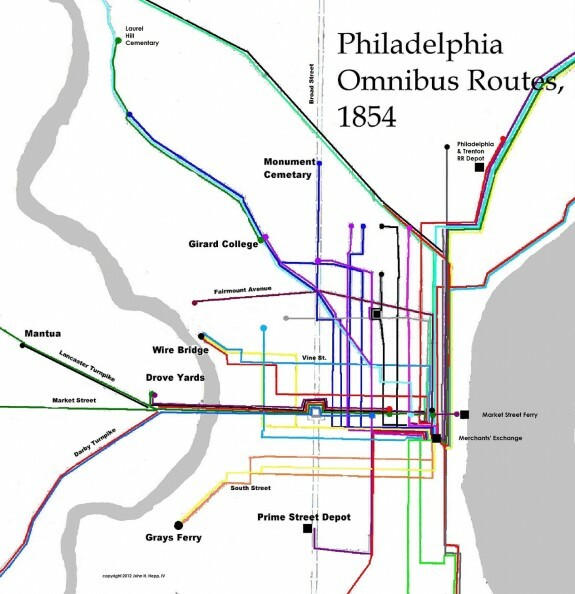 The omnibus, together with the railroad, created the first urban commuters and it effectively became the model for all future street-based public transportation development in Philadelphia. The omnibus was both a concept and a technology. As a concept, it was simply a short-distance version of the stage coach that operated on fixed routes, for fixed fares, and without the need for advance reservations. As a technology, the omnibus was a new form of horse-drawn vehicle that allowed for more rapid ingress and egress of passengers. Although the omnibus was “public transit” (in the sense it was shared), its relatively high fares precluded it from being “mass transit” and the majority of riders in Philadelphia and elsewhere were members of the middle classes and above. Omnibus riders were primarily business owners and senior “clerks” (salaried workers), whose firms were located in the central business district (then centered on Second and Third Streets) and who lived in Southwark, the Northern Liberties, and western Philadelphia. Along with similar people who used the early commuter trains, these were the first Philadelphians who could separate home from work by any appreciable distance. By 1830, the population of the city and its adjoining suburbs in the county was well in excess of 130,000 and it was the second largest metropolitan area in the country after New York. 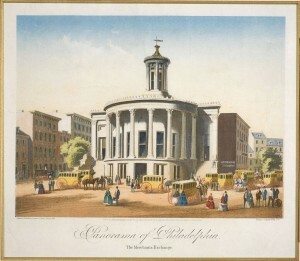 As the population expanded northward, westward and southward from the city’s original center along the Delaware River at Market Street, entrepreneurs imported the concept of the omnibus from Paris (where it originated in 1819 and the name was coined in 1828), New York (1827) and London (1829). James Boxall opened the first route in December 1831 on Chestnut Street between Second Street and Schuylkill Seventh Street (modern Sixteenth Street). The service operated hourly and charged a fare of ten cents. From this modest start, omnibus service quickly expanded throughout the city and its immediately adjoining suburbs. By the late 1850s over three hundred omnibuses operated over dozens of routes on a regular basis. While fares remained high on many routes (commonly ten or twelve cents), some shorter routes charged lower fares (as little as three cents per trip) and most lines offered annual “subscriptions” (or season tickets) to regular commuters. Based on evidence primarily drawn from New York, most historians have assumed that the unregulated omnibuses functioned in a rather wildcat manner; the little surviving evidence from Philadelphia in the 1850s, however, indicates a more regular and self-regulated operation with fixed routes on parallel streets. In 1855, the city imposed an annual tax on vehicles used as omnibuses and as this tax nicely coincides with the introduction of street railways in 1858, it allows the tracking of the omnibuses’ decline. In 1857, there were 322 omnibuses taxed in the city, by 1859, this had fallen to 59, and reached a mere one by 1864. The day of the horse-drawn streetcar had arrived. The rails of the streetcars allowed for smoother and faster transport with fewer horses and the new technology rapidly replaced the old omnibus as the primary means of transport on most streets. John Hepp is associate professor of history at Wilkes University in Wilkes-Barre, Pennsylvania, and he teaches American urban and cultural history with an emphasis on the period 1800 to 1940. Chudacoff, Howard P., Judith E. Smith and Peter C. Baldwin. The Evolution of American Urban Society. 7th ed. Boston: Prentice Hall, 2009. Ebner, Michael H. “Re-Reading Suburban America: Urban Population Deconcentration, 1810-1980,” American Quarterly (1985), 37:368-381. Hershberg, Theodore, editor. Philadelphia: Work, Space, Family and Group Experience in the 19th Century. New York: Oxford University Press, 1981. George West Blake, “Record of Omnibus Lines in the City of Philadelphia, 1851-1854,” Hagley Museum and Library, 298 Buck Road, Wilmington, Del. Samuel Castner Collection, Free Library of Philadelphia, 1901 Vine Street, Philadelphia. Harold E. Cox Transportation Collection (Collection 3158), The Historical Society of Pennsylvania, 1300 Locust Street, Philadelphia. Merchants’ Exchange Building, Third and Walnut Streets, Philadelphia. Once a central depot for Philadelphia omnibus service, now the headquarters of Independence National Historical Park.